Over the last few months hundreds of school pupils have taken part in the online rounds of the London Knowledge Quiz. Complementing the London Curriculum, the quiz offers primary and secondary school pupils the opportunity to demonstrate their knowledge of their city’s history, geography and culture as they compete with schools across the capital to win the Mayor’s Award for London Knowledge. After two difficult online rounds in June involving more than 450 schools, the three top scoring primary schools were Abbey Primary School, Cardwell Primary School and Michael Faraday School. The three top scoring secondary schools were Norbury Manor, Oasis Academy Shirley Park and Ursuline High School. 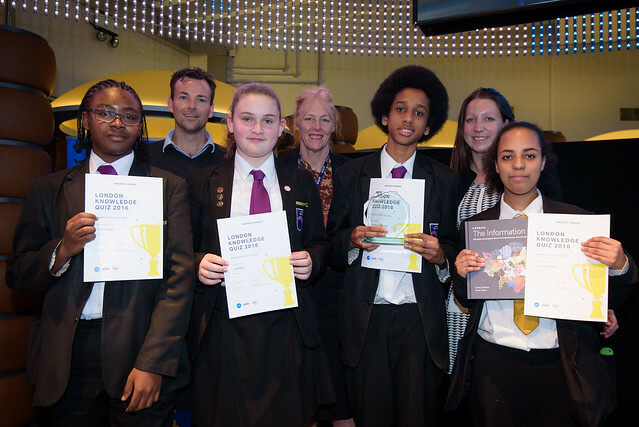 All six of the schools won a place in the live final on 5 July 2016 at the Museum of London hosted by TV presenter Michael Absalom. The quiz final topics included London's transport system, the Great Fire of London and fashion throughout the decades. The students went head-to-head in front of their fellow students and special guests in order to prove who knows the most about our wonderful city and its history and culture. The winning primary school was Michael Faraday School in Southwark. In addition to certificates and a school trophy, the pupils won tickets to Kidzania where they will gain the opportunity to learn about future career prospects. Ursuline High School in Merton topped the secondary school category and were rewarded with a guided tour of Tower Bridge. All of the finalists impressed the audience and judges with their in-depth knowledge of London and showed that their hard work revising paid off. The Mayor is delighted to partner with plotr and the Museum of London to deliver this exciting initiative. The online quiz is delivered by plotr, creators of a revolutionary new careers platform for 11-24 year olds. The quiz questions are all written by the Museum of London and aligned to key stages 2 & 3 and the Mayor’s London Curriculum. Piloted in 2013 and launched in 2014 with great success, the London Knowledge Quiz has been developed in parallel with the London Curriculum that came out of the Mayor’s Education Inquiry. The ethos behind the curriculum is to put the capital at the heart of education and learning by drawing on its plentiful and unrivalled heritage. Thank you once again for the opportunity to participate. The children thoroughly enjoyed taking part and we all certainly learned a lot more about London. We look forward to participating again next year. Flora Vidal, St Saviour's Primary School, Lambeth. Round One contestant. The London Knowledge Quiz is a brilliant idea that helps motivate the next generation to learn about their great city and share their enthusiasm with others. Ashley Bernard, Central Park Primary School, Newham. Round One contestant. We went away from the London Knowledge Quiz with a greater understanding of the history of our city. It was once said, ‘A people without the knowledge of their past, history, origin and culture is like a tree without its roots.’ Through this experience, we all got more in touch and closer to our roots. Students from Townley Grammar School, London Borough of Bexley. Flora Vidal from St Saviour's tells us of the impact that the Mayor's volunteering programme is having in her school.